Join us for a community potluck at 6pm followed by a presentation by Nathaniel Williams at 7pm. Explore hand-stamped and wire-wrapped jewelry in this special Mother’s Day jewelry workshop. Make your very own keepsake necklace featuring the initials of your choice- a loved one, a pet or your own! Share the special day with a loved one, your child, mom or best friend. This class is BYOB- we will supply the OJ for mimosas! Students must be at least 15 years old. $55 per person, or $95 per two people. Includes all supplies and a pouch to take your necklace home in or gift. Join artist Brooke Steytler on a Plein Air adventure! Plein Air is the act of painting outdoors. We will gather our supplies and head to the canal in Phoenixville, where Brooke will instruct students in the art of plein air painting with watercolors. All experience levels are welcome! During a break in this 3-hour workshop, students are welcome to picnic with treats and drinks provided by Soltane Cafe. *This workshop is best suited for adults,16 years and older. Have you always been curious about watercolors? Are you looking to learn new techniques? Then this workshop is perfect for you! Join local artist, Sarah Detweiler, in exploring this medium. The first hour will be spent experimenting and you’ll create a catalog of techniques. In the second half, learn how to apply those techniques to your art work and preferred subjects. $30/person, all materials included. All attendees must pre-register. 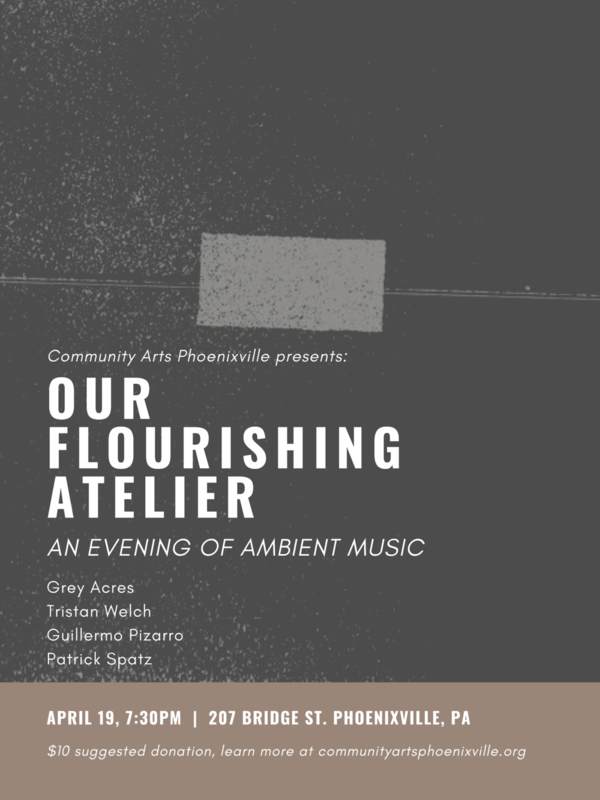 Please join us for Our Flourishing Atelier: An Evening of Ambient Music, featuring Grey (Acres), Tristan Welch, Guillermo Pizarro, and Patrick Spatz. $10 suggested donation. 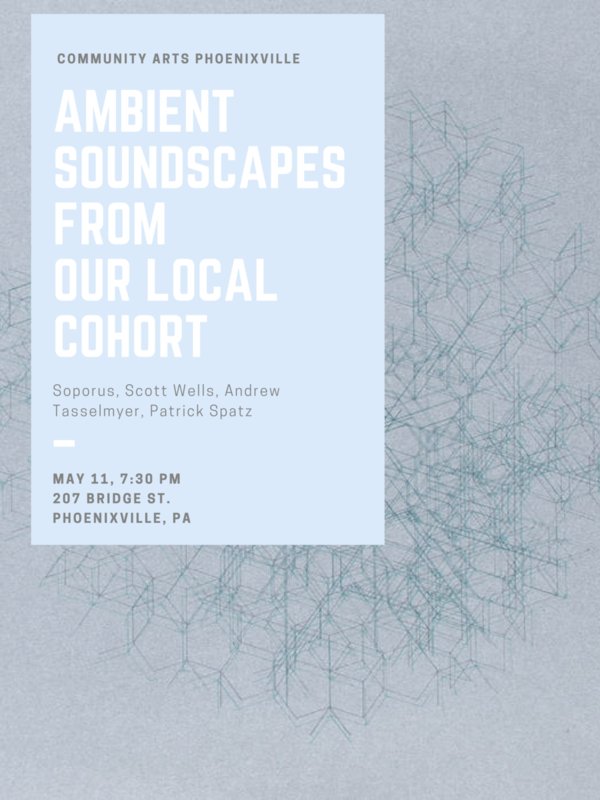 Flag Day Recordings & Community Arts Phoenixville present Subtraction, an evening of dark ambient textures and cinematic story telling through sound. Featuring Gleb Kanasevich, Victoria Cheah, and Guillermo Pizaro. $10 suggested donation. Welcome spring by making your very own coil flower pot! This class is for parents and children ages 7 and up. $30/child, all materials included. Adults create for free! Students will create their own vases by using hand building techniques. Participants may bring their own textures such as lace, buttons, shells etc. for an added personal touch. These vases will make great Mothers Day gifts! No experience needed. Please join us for a Gallery Reception: Saturday March 16th 3-5pm! Students will create their own mugs using hand building techniques. Participants may bring their own textures such as lace, buttons, shells etc. for an added personal touch. These mugs are perfect to gift or keep for yourself! No experience needed. Now that the holiday decorations are down, a pop of color in a cheerful little bird can make the gray days brighter. Learn some basic embroidery stitches to assemble and embellish a cardinal or blue jay. Please join us for an artist talk & reception by Neil Dreibelbis, the artist featured in our new gallery show, on Saturday, February 16th, from 2-4pm. The show will run from January 20th-February 28th.